The progenitor of the Blenheim, the Bristol Type 142, was ordered in 1934 as an 6-seat high-speed transport by Lord Rothermere; its top speed of 285 m.p.h. was 30 m.p.h. faster than the newest RAF fighter, the Gloster Gladiator. When asked by the RAF if they might test his new aeroplane, Lord Rothermere presented it to the service, christening it "Britain First." The Bristol Blenheim was the first modern, all-metal, cantilever, stressed-skin monoplane to be placed in production for the RAF. Acclaimed as a world-class light bomber and a major step forward in combat aircraft design when it first flew in 1936, the Blenheim placed the British aircraft industry in the forefront of modern day bomber design. Its fully-loaded top speed of 281 m.p.h. at 12,000 feet was only 25 m.p.h. slower than the prototype Hurricane. The aircraft set a pattern in light bomber design that would be followed by all other air forces. At the time it was taken onto operations by the RAF in 1937, the Blenheim possessed a performance that allowed it to outrun contemporary fighters. The Blenheim I carried a crew of three: pilot, navigator-bombardier, and wireless operator/gunner. Armament consisted of one .303 "K" gun in the port wing and another in as fully-powered dorsal turret, with an internal bomb load of 1,000 lbs. Range, fully loaded at 220 m.p.h. was 1,250 miles, endurance was 5.65 hours, initial climb rate was 1,540 f.p.m., and ceiling was 27,280 ft. However, such was the revolutionary pace of aircraft design and development during the two years between this event and the outbreak of the Second World War in September, 1939, that the aircraft proved woefully vulnerable to attack by the new fighters powered by high-performance engines. Nevertheless, the Blenheim bore the brunt of the fighting on every front to which the Royal Air Force was committed for the first three years of the war; despite its limitations, it served valorously. 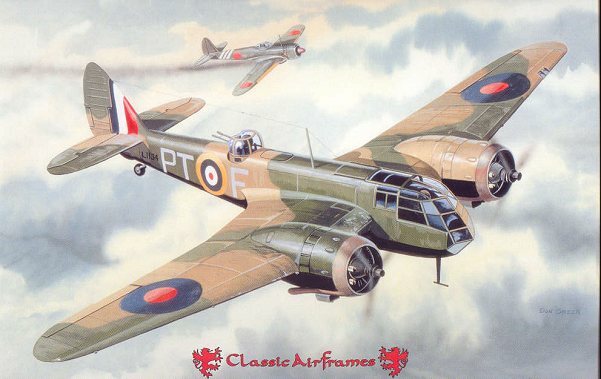 By the outbreak of war, the Blenheim I served in the bombing role only with Middle East and Far Eastern-based units. 200 had been converted to the Mk.IF as a long-range fighter with 4 .303 machine guns in a ventral pack. Blenheim IFs undertook the first night intruder missions over Germany on December 21-22, 1939. In the Spring of 1940, these aircraft made daylight missions to Rotterdam and Amsterdam to confront the Luftwaffe, and served with distinction as long-range fighters during the evacuation of Dunkirk. They were pressed into service as night fighters and became the first British aircraft to carry the A.I. Mk.IV radar, scoring the first successful radar-assisted kill on July 22, 1940. The Blenheim I served with several foreign air forces. Those of the Royal Yugoslav Air Force made valorous attacks against German armored forces, during which the Regimental Commander was killed by fragments from his own bombs. Finland used the Mk.I throughout the Continuation War, with licensed production continuing until the summer of 1944. 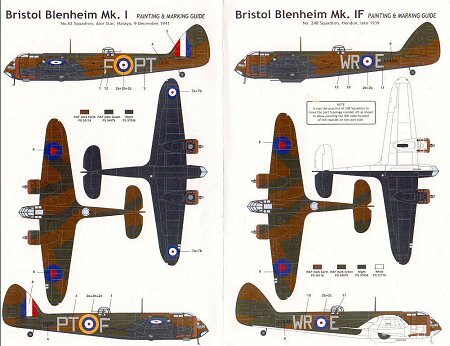 The Blenheim I formed the basis for the later Bristol Beaufort torpedo bomber and Beaufighter night fighter and strike aircraft. The Blenheim series has been eagerly awaited since their impending release was announced by Jules Bringuer of Classic Airframes in late 1999. The current release specifically mentions the contributions of Brian Fawcett, Richard Franks, Don Junis, Jim Maas, George Sithanek and John Vato, which gives this reviewer assurance as to the accuracy of the model, and underlines the good fit of the main parts I found during a test-fitting. As usual, the kit has been produced by MPM, and has the standard excellent surface detail with engraved panel lines and good-looking fabric effect on the control surfaces. The kit comes with three large injection sprues with parts that are among the best I have seen from MPM. The quality of the resin detail parts is first-rate. 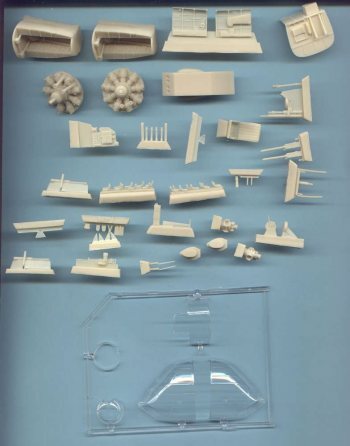 As a break from previous releases, the cockpit canopy and turret are injection-molded clear plastic rather than vacuform, and are very clear; dipping these parts in Future will result in glass that is as clear as the best vacuform canopy. 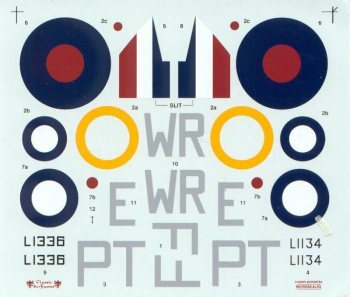 The decals are printed by MicroScale and provide markings for two aircraft: a Mk.IF from 248 Squadron in late 1939, and a Mk.I bomber based at Alor Star, Malaya, on December 9, 1941. Most likely, mine will be built as the Mk.IF. Just looking at the kit in the box, it is impressive on a quality basis. Test-fitting of the main assemblies of wings and fuselage reveal this is the best-fitting kit produced by MPM that I can remember. The kit is the best released to date by Classic Airframes and, to me, is well worth its price of US$55. One can see in the engineering of the kit that the coming Mk. IV will be fully up to the standards hoped for by modelers. The kit is highly recommended, and hereby moves to the head of the "to do" pile.